260 pages | 13 Color Illus. | 70 B/W Illus. Although there are many theoretical nanotechnology and nanoscience textbooks available to students, there are relatively few practical laboratory-based books. Filling this need, A Laboratory Course in Nanoscience and Nanotechnology presents a hands-on approach to key synthesis techniques and processes currently used in nanotechnology and nanoscience. Written by a pioneer in nanotechnology, this practical manual shows undergraduate students how to synthesize their own nanometer-scale materials and structures and then analyze their results using advanced characterization techniques. Through a series of well-designed, classroom-tested lab experiments, students directly experience some of the magic of the nano world. The lab exercises give students hands-on skills to complement their theoretical studies. 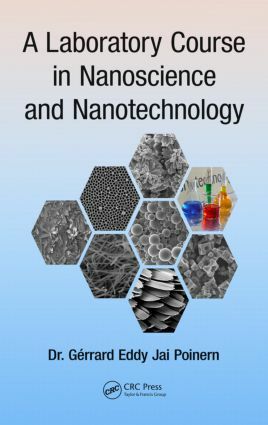 Moreover, the material in the book underscores the truly interdisciplinary nature of nanoscience, preparing students from physics, chemistry, engineering, and biology for work in nanoscience- and nanotechnology-related industries. After introducing examples of nanometer-scale materials and structures found in nature, the book presents a range of nanometer-scale materials and the synthesis processes used to produce them. It then covers advanced characterization techniques for examining nanometer-scale materials and structures. It also addresses lab safety and the identification of potential hazards in the lab before explaining how to prepare a scientific report and present research results. In addition, the author discusses typical projects undertaken in nanotechnology labs, such as the analysis of samples using scanning electron microscopy and atomic force microscopy. The book concludes with a set of projects that students can do while collaborating with a mentor or supervisor. "… provides a unique opportunity for students as well as professionals in academia and industry to learn how to synthesize nanomaterials. Clear and concise directions along with characterization methods provide the reader with a hands-on introduction to the world of nanomaterials. … This is a great way to learn about many of the modem methods for nanomaterial preparation on a small scale." "… with proper classroom guidance, the experiments described here, coupled with anecdotal examples the author provides on the utility of nanoparticles, could serve as a good basis for a full laboratory course." "The laboratory manual is an excellent and timely addition to the resources available to teach undergraduate and postgraduate students working in the nanosciences. Written by an internationally recognized expert in the field, the material is well presented, making nanotechnology accessible to students from a wide range of backgrounds. The scope covers nano-related topics in physics, chemistry, biology, and materials science and includes underlying theory as well as many hands-on experiments that have all been well tested and refined over the years this course was taught by the author. The experiments are underpinned by comprehensive descriptions of nanomaterials and the very important techniques of sample characterization that reveal the full nature of the nano world. The presentation is visually attractive, with excellent illustrations. … This book is destined to become a much-loved and well-used classic." Gérrard Eddy Jai Poinern is the director of the Murdoch Applied Nanotechnology Research Group and a senior lecturer in physics and nanotechnology at Murdoch University. His research interests include nanotechnology-based applications for environmental remediation, food security, biomimicry, photothermal and photovoltaics applications, and carbon technologies. He has been a recipient of the Bill and Melinda Gates Foundation Global Grand Challenge in Health Innovation Award for his work on the development of biosynthetic materials and their application in the manufacture of biomedical devices. He received a PhD in physics from Murdoch University.